MAX lines will resume regular service at the start of service tomorrow, Sunday, Sept. 4, following the Rose Quarter MAX Improvements project. The project, on the heels of improvements along 1st Avenue in Downtown Portland in May, replaced switches, realigned the track way, and upgraded the signal system to make for a smoother, more reliable ride through the station. We really appreciate the patience of our riders during the two-week construction work as service was disrupted and ran less frequently. The Rose Quarter Improvements project rejuvenates a portion of the original MAX line as we celebrate the 30th anniversary of our first light rail segment between Portland and Gresham. It opened on September 5, 1986, and was among just a few light rail lines in the country. Since then MAX trains have traveled nearly 77 million miles and provided about 688 million trips. A MAX train tests new tracks, signals and switches as part of the Rose Quarter MAX Improvements project. During the Rose Quarter MAX Improvements, crews took out 30-year-old switch machines and wooden ties just east of the Rose Quarter MAX Station and replaced them with new powered switches and a more durable track bed. The rails that turned off the main line toward the old trolley barn were removed. This improves the north side of the intersection and crosswalk at NE Holladay Street at 1st Avenue, which both drivers and pedestrians will notice. Crews realigned the track running into the station, making for a smoother ride into the north platform. The track redesign required adjusting the layout of the overhead power wire and moving poles that hold it up. Crews also installed a new signal system and made adjustments that will help us keep trains running on time through the area. MAX Blue, Green and Red Line service was disrupted and frequency reduced on all lines due to the improvement project. Most riders used shuttle buses between Interstate/Rose Quarter and Lloyd Center/NE 11th Ave stations to connect with trains. Our direct shuttle buses between the Kenton/N Denver Ave Station and Portland International Airport were also well used. 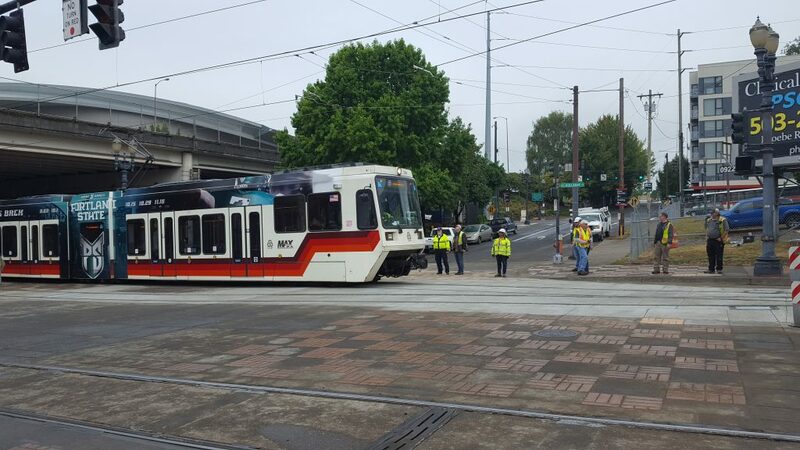 As part of TriMet’s agency-wide efforts to make our transit service better and improve MAX on-time performance, we are tackling a number of major replacements and upgrades necessary for any light rail system of such age. The next project will be spring of 2017 in Downtown Portland.